Boone Aeration & Environmental roof exhausters help your aeration fans effectively control grain spoilage in storage bins with flat or pitched roofs. These high volume fans produce the effective sweeping action needed to reduce condensation on top of your grain. For best operation, exhausters should run continuously while aeration fans are on, then long enough afterwards to assure removal of humid air from the overspace. Boone Aeration & Environmental roof exhausters help save operating costs and get better overall results from your aeration systems. Boone Aeration & Environmental universal tapered roof exhausters fit any sloped roof, round metal bin. The bottom inlet is shaped to fit between the flanges of your sheets. It fits corrugated steel tank roofs without any special adapters. Removal top cover lets you bolt unit to roof before cutting hole and allows easy access for service. A ½ inch wire mesh bird screen is supplied as standard. For greater aeration capacity on concrete tanks, add the rugged vertical axial roof exhauster with up to 27450 CFM. They’re available for installation on new or existing concrete roofs. 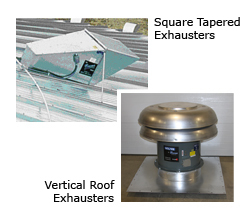 Exhausters are available separately or as a complete package with raincap. Both styles come standard with exterior lube zerks for easy maintenance.